BellCommander provides a flexible and affordable system for emergency notification and paging for school campuses, businesses, and other organizations. 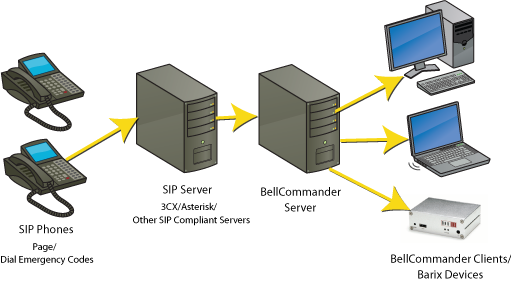 BellCommander works with SIP phones, which are business phones that operate over a standard I/P data network. Paging: To send a page from a SIP phone, simply dial a BellCommander extension and the zone code for the zone you want to page. BellCommander will automatically broadcast audio from the phone to all clients and Barix devices in the zone. Emergency Notification:To trigger an emergency notification from a SIP phone, dial the BellCommander extension and the emergency code. Each emergency code can be programmed to play and loop audio files and trigger relays for other emergency management systems and devices. SIP Server: BellCommander’s SIP interface works with SIP compliant servers and has been tested with 3CX and Asterisk. 3CX is recommended for new phones and since it is Windows-based, it can also run on the same server as BellCommander. The free version of 3CX can be used for paging from SIP phones and for emergency notification. BellCommander Requirements: For SIP paging, a Pentium IV 1.4 GHz or higher processor is recommended. BellCommander is designed for Windows 2000, XP, Server 2003, Vista, and Server 2008. 5 licenses – $299.95; 10 licenses – $499.95; 25 licenses – $699.95; 50 licenses – $899.95. 100 licenses – $999.95.